I have never seen The Captain so excited about a pair of running shoes before... when the Fed Ex man brought this parcel from Under Armour, he ripped into like a kid at Christmas! And they fit like they were made for him. When he knew he was going to be trying them out, he looked at the Under Armour web site and checked their sizing chart to find the right fit. But it is kind of a guess when you don't have the shoes there to actually try. I think that the natural tendency, mine at least, is to order larger than you might really need, but he went by suggested sizing and the shoes he selected fit perfectly. And he loves the color! Who knew men were so interested in the look of their running gear? Well, apparently they are! I couldn't get him to take the new kicks off! And he wore them around inside pretty much for the rest of the day. His first opportunity to take them out for a test run happened the next day... the weather has been blustery and soggy here, on and off for a couple of weeks now... so we have only been getting out intermittently, between rains. And we both thought it might be a good idea to go for a short run the first time he wore the new shoes, just to make sure they were going to be all right. Normally when we run, he holds back and stays at my pace. He is usually only interested in going cause I want to go. But on this particular day, I had to run a fair bit harder to keep up with him. He was really enjoying himself and I could tell he was loving the running for himself, not just because I was happy to be out. I kept asking him how the shoes felt, and how his knees felt. And each time the reply was 'great'. This was a real concern for me as we know he needs a cushioned shoe. And this Under Armour Spine RPM Running Shoe provides lightweight and responsive cushioning without sacrificing stability and support. We finished that 3.7 km and came in and had a good long stretch. He went and checked the Weather Channel to see when we might go out again. That was a first. 5 days later we set out for our normal 5 km around the neighborhood and he was prancing. The Captain has a very natural Chi Running gait. He lifts his whole foot and has a fairly upright posture with just a bit of a forward lean, and lands each step on the middle of his foot... a gait I spent a great deal of time and effort learning to execute, over the past couple of years in reading about Chi Running and Walking. It was another good run and he enjoyed it a lot. He says that he is confident in the support the shoe offers and that is it very comfortable. And just as an aside, he is also happy that the laces are not overly long like they are in some of his other running shoes. A few days ago, another 5 km test around the same route found us completing it in 1-1/2 minutes under our normal time. I am happy to say that I am getting faster myself, cause he seems to be pulling me along faster and I know it is because he is feeling so great running in these Under Armour shoes. There are a lot of large trees in our neighborhood... chestnuts, a variety of large oaks and maples, birch, willows, figs and lots of other fruit trees... it is Fall and the leaves have been raining down the past couple of weeks and covering the sidewalks and streets. They are beginning to rot so the sidewalks and trails are getting quite slippery and we have been cautioning each other to take care not to slip on the rotting leaves or on the wet paved trails. But The Captain is very confident in the traction of the solid rubber sole of his new running shoes. Even though they are lightweight, they are solid and have a well-designed tread. 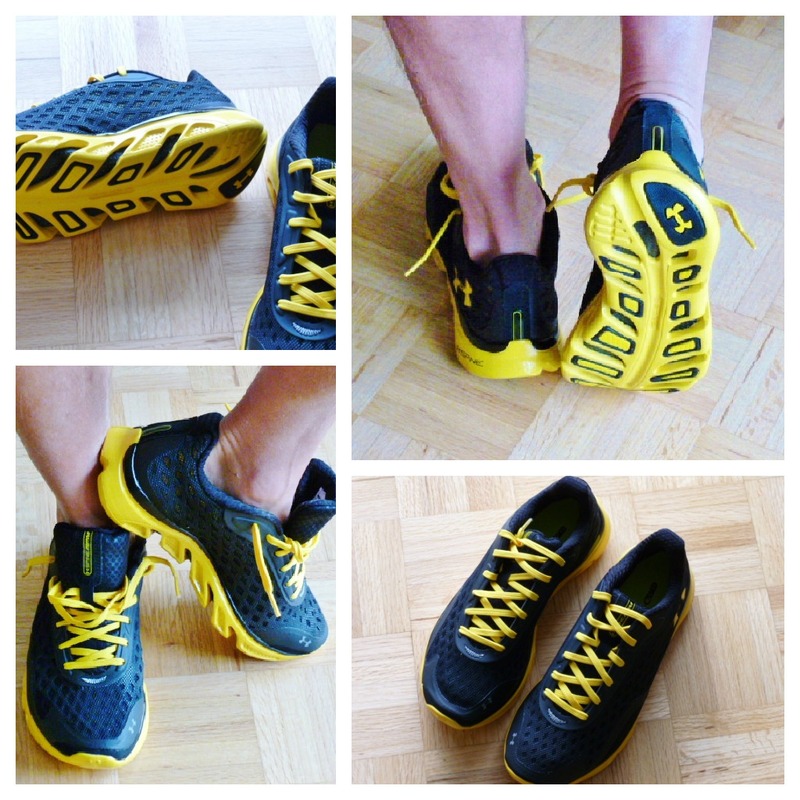 We urge you to have a look at the Spine RPM Running Shoe on Under Armour's web site and read some of the other detailed reviews you will find there. It comes in a wide array of colors and sizes so you are sure to find something that suits you as well.. There is a lot of technical information available, too, about the innovative design of these Spine shoes. And you can check out other Under Armour Men's Shoes on their web site, too. And be sure to check back tomorrow ... hint hint.... something very special coming your way... for you ladies too! Under Armour did provide The Captain this pair of shoes at no cost, but the opinions expressed are his via me, alone. So happy the captain loves his new shoes! They look fantastic. Those are some good lookin' shoes! Good to know they perform well, too! Oh my HUSBAND WOULD ADORE ADORE ADOER too. Great review. Long laces drive me crazy! It's the constant tapping I hear when the laces are long! Awesome shoes! Glad he likes them! So great when you find the perfect shoes! Living here outside of Balt, we love all things UA! Those are cool shoes! I am glad he is liking them so far! he looks so fancy in those shoes! love it! Nice loooking shoes! When a shoe fits just right, it really does make you want to run. Those look fantastic! Oooh - something fun tomorrow, I'll be here. I'm always amazed at the shoe companies who can put together a great website and sell shoes online that fit perfectly. Impressive. What awesome shoes and they do sound to be the perfect fit! Those are some good looking shoes! Way to go Under Armour!!! I LOVE the shoes! I think the Captain looks great in them. I'm glad he loves them so much :) GREAT review....I can't wait for the surprise! Love the look of the shoes! Glad The Captain likes them so much. Those are nice looking shoes! I've never tried UA for shoes -but I learning about all brands! love those shoes! I have a pair of under armor shoes that I got to run it I feel like they are more of a crossfit shoe though than a running shoe! I love under armor though! Those shoes looks really awesome! Love them and your great review. I did not know that Under Armour had shoes!!! I always thot of them as a clothing line! Love the looks!! I have decided that the brighter the better with shoes - these are very fun! I love that the Captain is matching! Those shoes sound awesome! My kids wear Under Armour shoes for most of their sports shoes. They just seem to fit better than the other brands. Look at him all color coordinated and pimping UA! I love all things UA, so I'm glad to hear the kicks are winners. I need new shoes (like three years ago) so I'm definitely going to check out UA's selection! What a great looking pair of shoes. I had similar colours years ago and loved those shoes. I love the bright colours these shoes are available in. Always in the market for a great lightweight shoe. Mine are getting pretty worn out. And I know I shouldn't be running in worn out shoes! But i can never find any that I really like. Mine were purchased on clearance and I haven't seen them since. Boo. Great review! I'd love to know how the women's shoes do. I particularly like that Captain was confident in their traction. Nothing worse than slipping on a run!